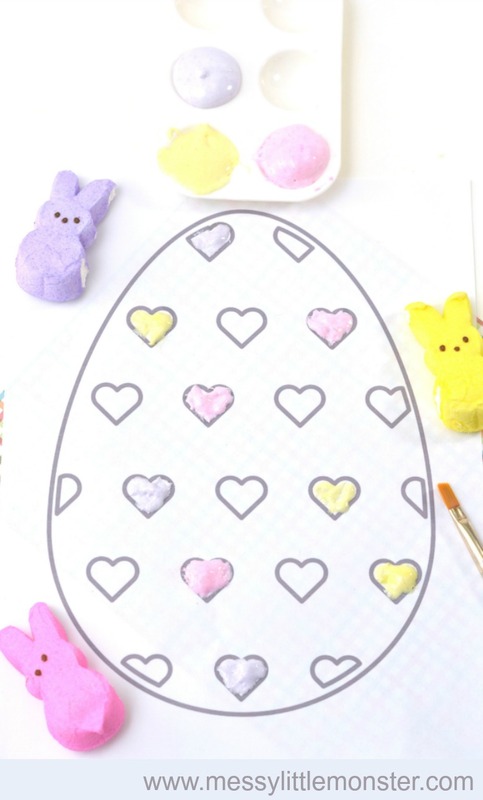 Make some edible puffy paint from peeps candy this Easter. What fun! 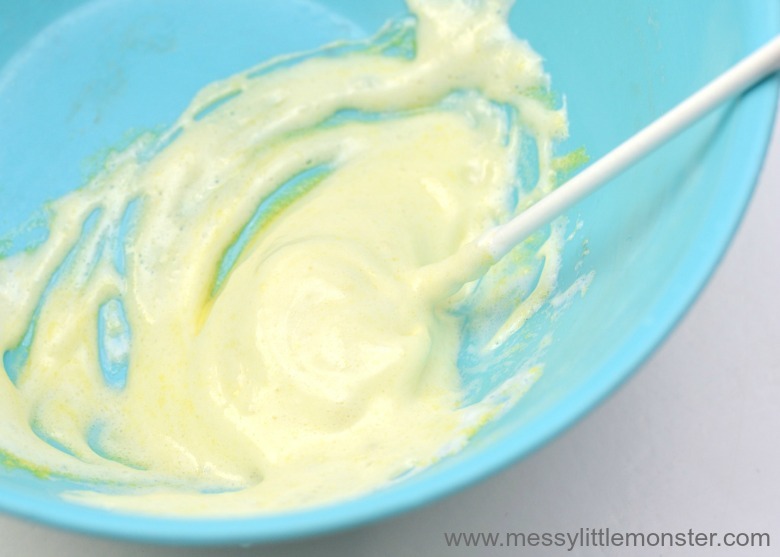 Kids will love getting sticky and messy with this fun paint recipe. You can paint using a paintbrush or young children might enjoy finger painting with the paint to bring an extra sensory experience to the painting process. We have a free Easter egg colouring sheet for you to download ready to be painted or alternatively you can create your own design. 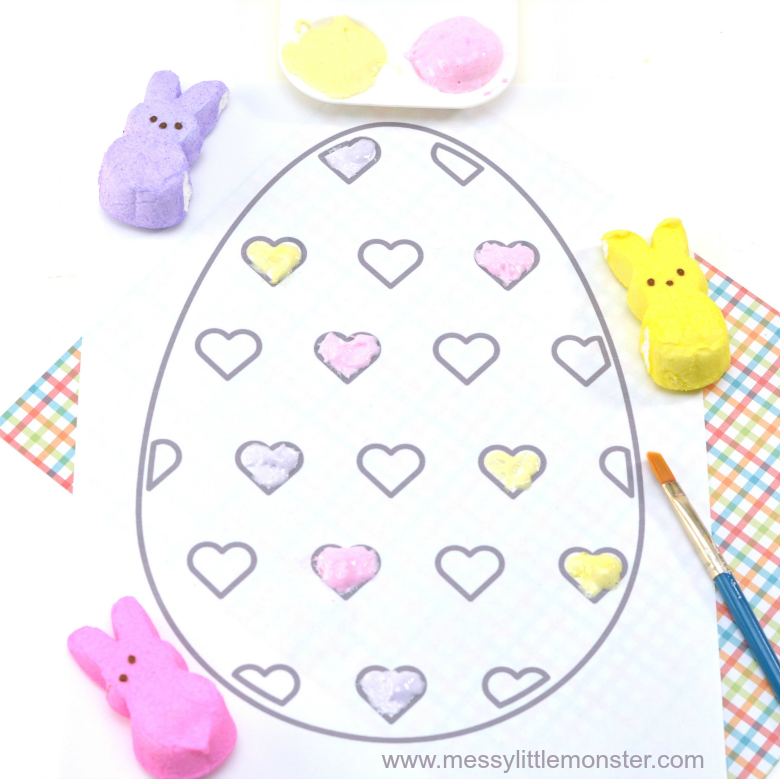 This activity doesn't have to just be for Easter, it would be fun any time of the year. 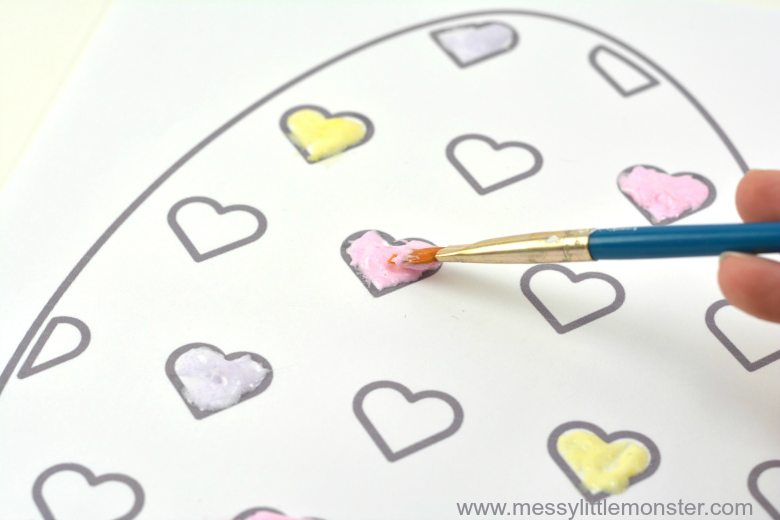 We love trying out new painting ideas and this peeps puffy paint is really fun. We also have two other puffy paint recipes that you can try. The first is a shaving foam and glue puffy paint. Once dry it stays really puffy and feels soft to the touch. The second is a microwave puffy paint made from flour, salt and water that puffs up when heated in the microwave. This one really wows children as it seems to magically puff up when placed in the microwave. The special thing about this peeps puffy paint recipe is that it is edible which means that you don't have to worry about younger children putting it near their mouth. Other taste safe or edible painting ideas that we have enjoyed are taste safe ice painting and painted toast. 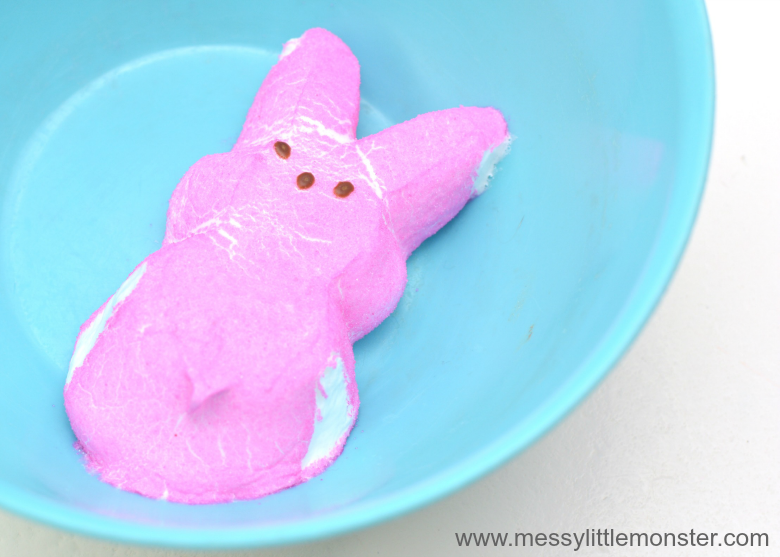 To make this fun edible puffy paint begin by placing one Peeps candy in a microwave safe plastic bowl. Place the bowl in the microwave for about 10 seconds. The Peeps will puff up to about 3 times their normal size. Leave them for a second to go back down to just a little bigger than their normal size. Young children will love watching this process. Give the heated Peeps candy a stir. If all of the marshmallow is not melted, return the bowl to the microwave for a further 5 seconds. When stirred, the marshmallow should puff up into a smooth and tacky substance that can be applied to a paintbrush. 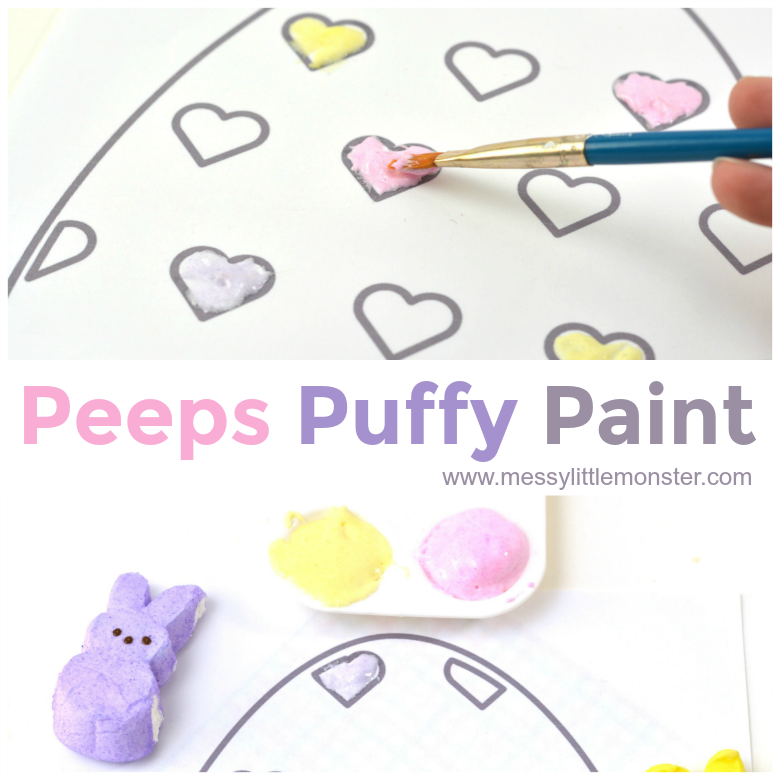 Make sure the peeps puffy paint is cool enough to touch and then give it to your child to paint with. They can either dip a paintbrush into the paint or use their fingers for a more sensory experience. We have a free Easter printable for you to download and print out if you would like to paint an Easter colouring sheet with your puffy paint. 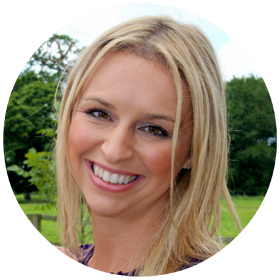 Alternatively you might like to make your own picture or just have fun exploring the process of painting with a new paint recipe. As the Peeps candy cools down, it will begin to become harder to work with. You can simply return it to the microwave for 5 seconds before continuing to use it. It is best to work with one colour of peeps puffy paint at a time as it needs to be slightly warm to be workable. 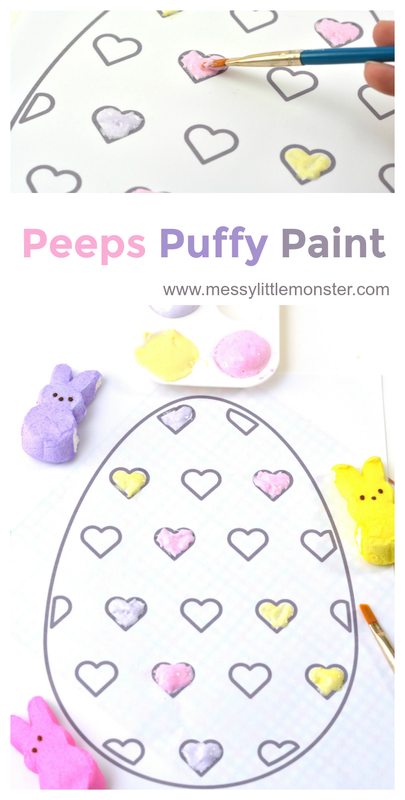 These peeps puffy paints would be fun to use for any painting project, but if you would like to use the Easter egg colouring sheet that we have please feel free to download it using the link below. To download the Easter egg colouring sheet add $0 and click on the 'I want this' box below. It may take a moment for the page to load so please be patient. Did the children enjoy using this edible peeps puffy paint? 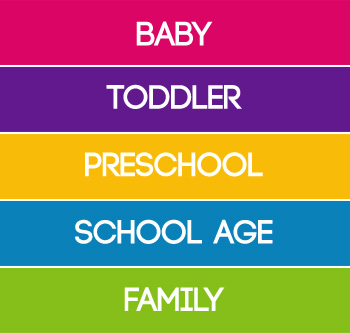 We have lots more fun painting ideas for you to try. Some of our favourites are painting on foil, water pistol painting and painting with nature paintbrushes.